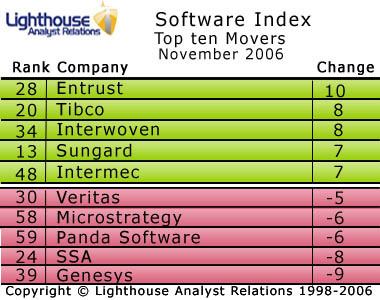 The top ten companies in the Software Index invariably include BEA, CA, Google, Microsoft, Novell, Oracle, SAP, Siebel and Symantec. This month is no exception. Tenth position, however, is occupied by a newcomer. For some fun, send us a postcard telling us who you think holds tenth position. The winner gets a post card back from London! Entrust has had a storming month, vaulting ten places up the rankings and straight into the top 30. Its third-quarter results posted higher revenues than last year, but less profit. This is partly due to a series of one-off costs, integrating two recent acquisitions and finally completing a revenue-generating OEM relationship with Vericept. Furthermore, last week, Entrust lodged a lawsuit against Corel for copyright infringement. Small wonder the analyst community has been focusing its spotlight on Entrust. Tibco has also had a terrific month launching its Collaborative Information Manager and jumping up eight places. It has also entered the top 25. This week it was “Honored With a Prestigious Platinum Award” from Bloor Research; we will wait to see the impact of that. Other climbers include Interwoven, Sungard and Intermec. Interestingly, the analyst focus appears to have shifted away from SSA which has fallen eight places out of the top 25. Genesys has also had a bad month falling nine spots and finishing 39th in the rankings. This month, Veritas finally dropped out of the top 25 for the first time in a very long time. Not only does this demonstrate how powerful the Veritas brand has been over the years but also how slow the analyst community is in reacting to the Symantec ownership of the firm. If you’d like to be sent the top 25 of the Lighthouse Software Index each month, please send an email to analysts [at] lighthousear.com.